The personality of the Great Sahibkiran Amir Temur, his rich spiritual heritage, activity, role and importance in the world civilization are studied with great interest not only by domestic but also by foreign scientists. These qualities are once again confirmed at the events, organized in connection with the 683th Anniversary of the outstanding statesman and public figure, skilled commander. On this occasion, on April 9, a solemn event was held at Amir Temur Square. This place was crowded with senators, deputies, scientists, writers and poets, artists and cultural figures, teachers, spirituality propagandists, students, general public, representatives of national cultural centers, international organizations and diplomatic corps operating in Uzbekistan. An exhibition of books about the history of Amir Temur’s life and Temurids, priceless heritage was held. Director of the State Museum of Temurids History Khurshid Fayziyev, the Ambassador Extraordinary and Plenipotentiary of the French Republic Violen Biyet de Vilmore, Head of the Department of Research of Historical Documents of the Institute of Oriental Studies named after Abu Raykhon Beruniy of the Academy of Sciences of the Republic of Uzbekistan, a leading researcher Sanjar Gulyamov and others noted Sahibkiran Amir Temur’s huge role in world civilization. First Deputy Chairman of Uzbekistan Writers’ Union Minkhojiddin Mirzo noted that the ideas forwarded by Sahibkiran are consonant with reforms implemented in Uzbekistan, and read out an excerpt from his work “The Light of Sahibkiran”. The report of Doctor of Philology, translator Bakhodir Ermatov, devoted to analysis of works about Amir Temur in the history of literature of Western Europe people and their interpretation of Amir Temur’s image made a great impression on participants of the event. Military servicemen of the Ministry of Defense and the National Guard demonstrated their performances. 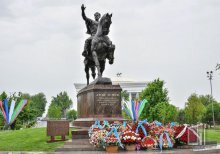 Flowers were laid to the monument of Amir Temur. Advisor to the President of the Republic of Uzbekistan H. Sultanov attended the event. On the same day, a roundtable discussion on the role of people’s diplomacy in Amir Temur’s and Temurids state was organized at the State Museum of Temurids History jointly with the Committee on Interethnic Relations and Friendly Ties with Foreign Countries under the Cabinet of Ministers of the Republic of Uzbekistan. Events, meetings, conferences and roundtables dedicated to Amir Temur’s birth are being held throughout the country.